SAN DIEGO — Team 10 discovered allegations in dozens of lawsuits accusing San Diegans of not doing enough to make their business accessible to everyone. But are people taking advantage of the law? There’s something to be said for owning your own business. Sure, there are the long hours, but there is pride in creating something from nothing and providing for your family. You can see that pride in Em Trinh's smile. “I love to cook,” said Trinh. “I love the people who come in here." Trinh moved to the United States from Laos about 30 years ago. "Everybody in the world, when you say you want to come to United States, everybody is going to go for it,” she said. This year, she’ll have owned Chen’s Golden Palace in El Cajon for 23 years. "Over 20 years there's nothing, nobody complain anything, you know,” Trinh told Team 10. That streak of no complaints just ended. A man named Dwight Banks sued Trinh for “violation of civil rights on basis of discrimination in public accommodations,” according to a lawsuit. Trinh says it surprised her. The lawsuit alleged there was no accessible disabled seating at the defendant’s place of business and there was no clear space at any of the dining areas. The lawsuit highlighted eight specific items the restaurant lacked such as fixed seating, table height and clear space. "We’re going to go through these eight items in order,” said Steve Schraibman. Schraibman is the head of Arcor-Inc. and is a Certified Access Specialist . Working with Team 10, Schraibman got out his tape measure went through each of the eight items Banks' lawsuit claims Chen’s Golden Palace lacks. "If I came into this restaurant (Chen’s Golden Palace) this would be my favorite table because of the amount of space it has,” he said. After completing his inspection Team 10 investigator Adam Racusin asked Schraibman if the eight allegations in the lawsuit were true or false. “They are completely false,” Scriabman said. According to San Diego County court records, Dwight Banks is the plaintiff in dozens of lawsuits filed by one La Jolla based attorney, Ted Shin. Team 10 wanted to talk with Shin and his client about the lawsuits. Banks referred any comment on the suit to his lawyers. Team 10 called Shin’s office, even went there, but there was no response. Em Trinh tells Team 10 some of her customers have been coming to the restaurant for more than a decade. A wall at the back of the restaurant showcases pictures sent in from families through the years, showing their appreciation for her service. "I’ve been here 23 years, nobody complain,” she said. Trinh is working with an attorney. According to court records, Trinh’s attorney filed a response to the lawsuit and demand for a jury trial. 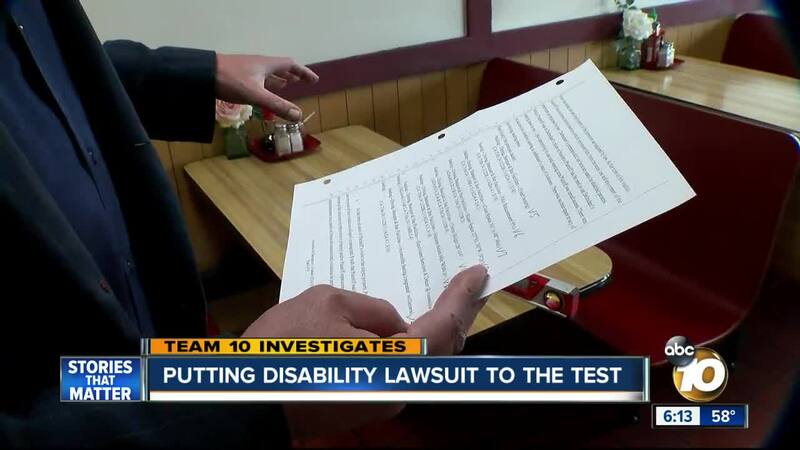 To be fair, experts tell Team 10 many businesses in the state do have disability access issues and haven’t come up to the standards set in the law. Right now one of the only ways to make changes is through lawsuits, but an advocate tells 10News there are big problems with the current laws.